Routers can be tricky. Some of them have great features but have a terrible GUI (Graphical User Interface). Others have a great GUI but basic features. 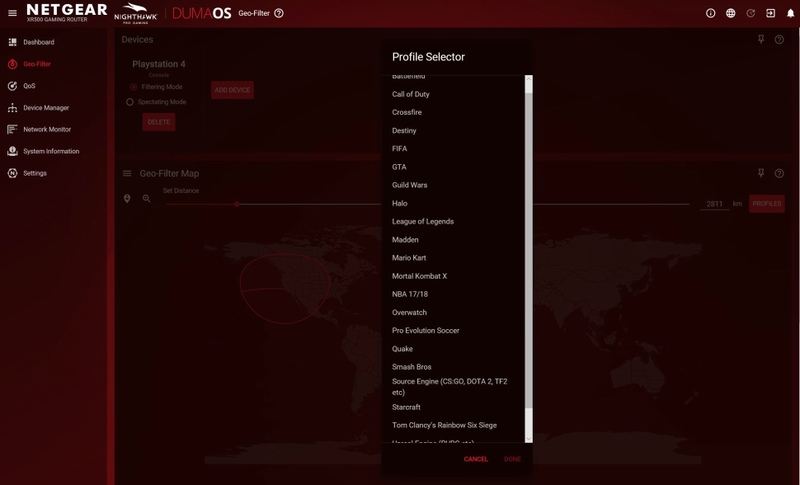 NETGEAR created some amazing gaming features, but now they have the help of NetDuma’s DumaOS as well. The combination of a great GUI and features will be sure to please. Let’s take a closer look. I’m going to cut straight to the point and say that the DumaOS is outstanding. Every detail is laid out so clean and easy to read. The homepage is made up of different tiles you choose to pin to it. Similar to the way Microsoft handles live tiles, you can move them to where you want by dragging them, or even change their size. It may seem a bit daunting at first, but you can set it up any way you like. Some of the key features I was looking forward to was the GeoFiltering and QoS. The GeoFiltering will essentially only connect you to servers within the designated area you’ve selected on the map. You won’t have to worry about it affecting your other devices, as you will need to set it up for each individual device. They’ve even made it easy for gamers too. If I want to set up a GeoFilter on my PlayStation 4, there is a list of profiles to optimize your experience online for that specific game. Although it may take a bit longer to find a game, you will have the best connection possible. This means less raging and more playing. 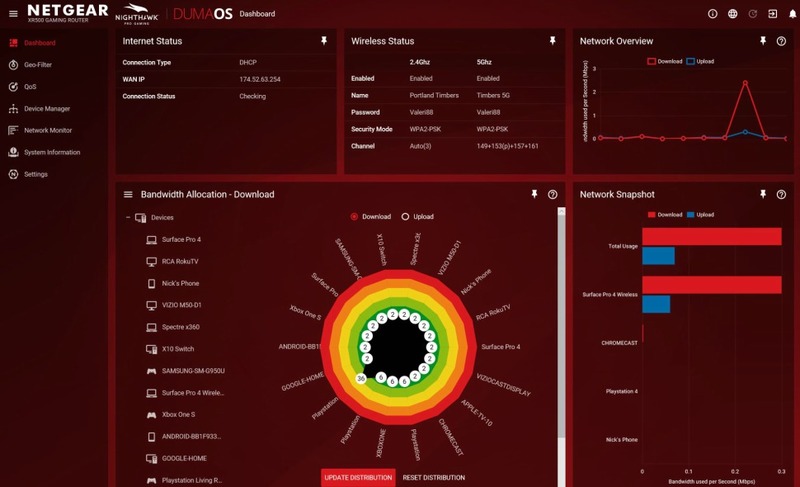 A QoS will let you set different devices that are connected, to different priorities if desired. For instance, I would like for my Xbox One to have a higher priority than my phone trying to download updates or movies. QoS can cause some slowed speeds when wired, but I have not experienced that with the XR500. The process is super easy too. All devices are put onto a graph. The graph equally divides the devices to have the same priority. All it takes is sliding the node for the desired device or clicking the device and setting an exact QoS/Mbps. There is another feature called Smart Connect. It will broadcast one signal for a device to connect to but will intelligently select the best WiFi band for your connection. This means you will have one SSID and password for both WiFi bands. Nice for those that like to keep things tidy. Since it is a Nighthawk router, you will find all the same advanced features that you get with other Nighthawk routers. This means you’ll still have the same network monitoring you can get from other models. Some of us are plagued by our ISPs new data cap restrictions, so it helps keep them honest when you have something to compare their data against. When it comes to functionality, the XR500 has it all. Each category will have breakdowns to see the nitty-gritty of what devices I’m using. The only downside is there isn’t a mobile app to it yet. You can use the NETGEAR and Genie app, but you won’t have access to a majority of the router’s features unless you log in from a desktop web browser. 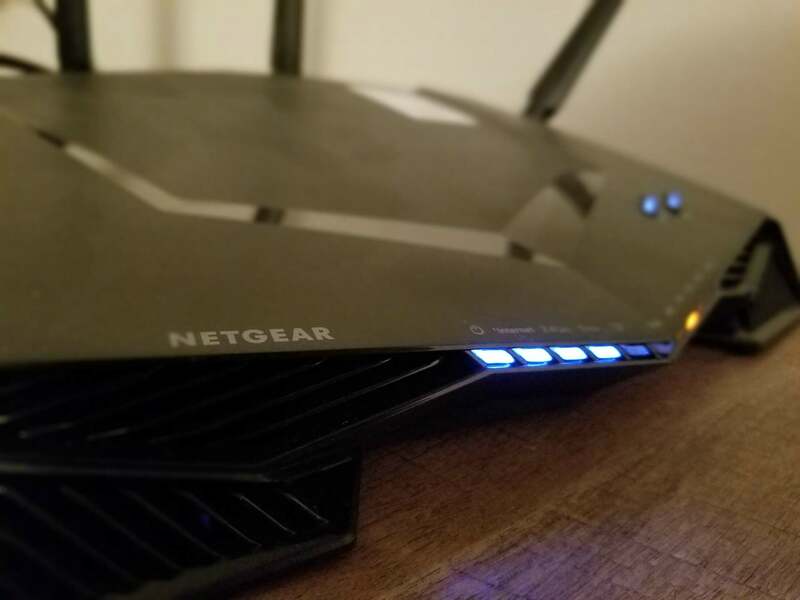 The NETGEAR XR500 has a very aggressive look. Lots of sharp lines and vents make it the Lamborghini of routers. Although it would feel more premium with an aluminum, the body is made of plastic. The antennas need to be screwed in securely as the will become loose over time if not seated properly. There are 4 antennas. 2 on the back and 1 on each side. Makes it a bit wide. Although it’s not aluminum and is a bit wide, you will not want to tuck it away, as it definitely has a high tech/gamer aesthetic that will look great near your PC or Console. I can absolutely recommend the NETGEAR Nighthawk Pro Gaming XR500 to anyone, especially gamers. Is it groundbreaking? Somewhat, but it will take the stress of getting the best connection and throw it out the window. The powerful tools and ease of use to apply them make this convenient and reliable. It is a bit pricey, but totally worth the convenience in my opinion. You can find more details on purchasing an XR500 on NetGear’s website here www.netgear.com/npg/xr500. Still have questions? Hit me up on Twitter at @keegbot and I’ll get you an answer. Thanks for your continued support!